Book a place on this complimentary tour & lunch of Marc Koehler Architects’ radical new cooperative development, Superlofts: Winner of the WAF Housing and Directors Choice Award in 2017. Bus departs at 11:20am prompt. Tour 12-1pm, followed by a complimentary lunch close to the Superlofts at Pont 13. Bus returns to WAF by 3:00pm. See inside apartments and hear how this innovative concept, based on the ‘Loose Fit/ Open Building’ approach is transforming under-used former brownfield sites. Our guide, David J. Tol (Associate, Marc Koehler Architects) will explore how this concept allows for maximum flexibility of use and easy spatial adaptability over time, often merging functions such as living, working and hospitality. 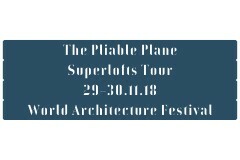 This tour is part of ‘The Pliable Plane’ a series of Sto Werkstatt events, inspired by the Bauhaus textile designer Anni Albers that traces where her attitudes toward architecture and design may be seen in the next generation. ‘The Pliable Plane’ takes its name from Albers’ essay ‘The Pliable Plane: Textiles in Architecture’ (1957) and draws on themes she explores of surface pattern and structure, flexibility and responsiveness of materials, and adaptability of a buildings programme. This coincides with the opening of Tate Modern’s first UK full-scale retrospective of her work in London (11 Oct 2018 – 27 Jan 2019).